"Pain throws your heart to the ground, Love turns the whole thing around. Fear is a friend who's misunderstood, But I know the heart of life is good." Today was one of those days where I woke up and realized just how blessed I am. My alarm was set for 7:10 (the usual), and for some reason I woke up at 6:10 a.m. on the dot. Wide awake. I couldn't figure out why I all of the sudden woke up... until I remembered that I had a meeting across town at 7:30 a.m. Pretty sure my uber punctual guardian angel woke me up on that one. I breezed through getting ready and Adam offered to do all of the things I usually do in the mornings (since I leave after him) with a smile on his face. Then an "I love you" and kiss goodbye. What a blessing. I went to grab a coffee and I thought about the fact that not everyone feels the way I do today. I had an overwhelming urge to spread the joy in any way I could, and picked up the tab of the lady behind me in the drive-thru. I don't say this to brag about my intentions, I just hope that she was simply able to see a little joy and sunshine this morning. And I hope that when she too feels that, she can pass on the love to someone else who might need it. Because heaven knows we could all use a little dose of sunshine every once in a while. As I drove off, I let the words of the songs wash over me, smiled, and thought about so many things to be grateful for today and everyday. Good days and bad. Today I am overwhelmed and humbled. Although life can get tough and painful at times, there is peace in knowing that there is always hope. Just keep going, because there are great things for you on the horizon, I just know it. Maybe you need a little encouragement today? Do you ever have those freak out moments? You know, when the phone rings and a few friends are just going to stop by. 1) Do we have wine? 2) I don't have anything fancy for them to eat. And then in a moment of sheer joy (or complete chaos), you happen to find that store bought brownie mix. You know, the one collecting dust in the back of your cabinet. You bought that mix with the intent of getting yourself out of a jam, such as this, but for some reason it just seems boring. Thankfully over time, I've learned a quick and easy way to jazz up that good old box of Pillsbury Chocolate Fudge brownies so they look like Ina Garten whipped them up. Yes, it's that simple, and the brownies turn out AMAZING! I made this this weekend and I had 3 people ask for the recipe (hehehe). All you need is a few things on hand to turn drab into fab in no time flat! I think it would be fun to scratch the PB swirl and add crushed up Oreos, or maybe marshmallow + nuts (Rocky Road anyone?) for a different gourmet take. I'm addicted to not working. Prior to the big day, I decided to add on 3 more vacation days after our honeymoon just to relax and unwind, and good Lord Almighty, I am so thankful that I did! After months of wedding planning taking up every ounce of free time, I was more than ready to get back into doing the things I love, but have neglected. So I bet you can't guess what I did during my days off? I totally hit up Pinterest for some inspiration, and boy did I find it! First project? Making homemade, healthy granola. I used a few different recipes for ideas and then just totally went for it on my own. For the many following on Instagram who saw the final product photo and asked for my recipe, here you go! You seriously can't go wrong winging it either. Well, unless you fly off the deep end and add weird things like pickles and sardines. Who on earth would do that? Okay, I've lost it. Time to shut my yapper and pass along the yumminess! 2) Combine oats, almonds, flax seed, brown sugar, salt and cinnamon in a large bowl. Mmm... so good and toasty! 3) Warm oil and honey in a small saucepan over the stove, stirring frequently. Add vanilla. 4) Once the mixture has liquified, poor over the dry oat ingredients. Gently still all together until blended. Don't be afraid to use your hands to help the process! 5) Spread the granola out on a cookie sheet with edges (jelly roll pans are great!). Bake for 40 minutes, stirring every 10 minutes to be sure of even toasting. 6) After you remove the granola from the oven, allow to cool and then add raisins. 7) Store granola in a sealed air-tight Tupperware. It will keep for a week at room temperature, or 3 weeks in the fridge. I'm telling you, if you sprinkle a little granola over Greek yogurt and fresh berries, it's pure heaven. The lovely Sharaya Mauck, from Sharayamauck Photography, decided to send over a handful of images before she left for her tropical vacay. What a treat! Even though there are only a few, I am loving the way they turned out... so us. Oh! Can you tell that Adam and I were cracking up at each other the whole time? Little can you tell that it's POURING down rain and the thunder claps are so loud the hair on my arms stood on end. As a matter of fact, that may be why we're completely cracking up. Once Miss Sharaya gets back from sipping pina coladas and tanning beachside (jealous! ), I should have much more to share - decor, behind the scenes, first look, ceremony, first dance, etc.! It's been f-or-e-v-e-r. How are you, dear friends? Everyone hanging in there? It sure feels good to be back to real life (and blog world!) after an insanely amazing wedding and honeymoon vacation. I cannot wait to show you photos from the big day, but don't have them back quite yet! So our wedding was incredible. 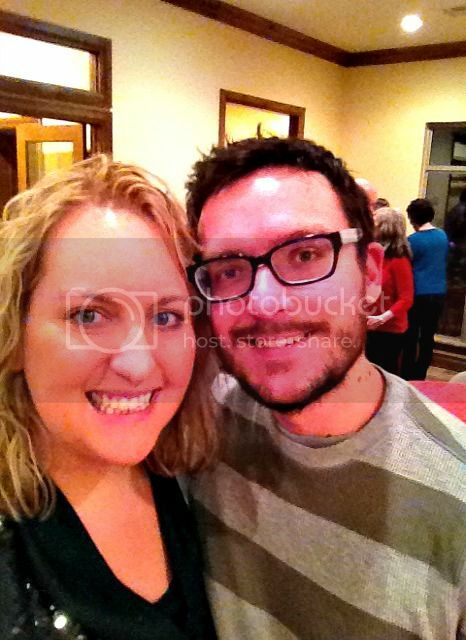 The food was great, the wine was flowing, people were breaking it down on the dance floor, and it was a blast. The best part? Being completely and utterly overwhelmed by the love and blessings of our dear family and friends. What an unbelievable feeling. The venue being set-up in the morning. The candy bar, which was a total hit. So that's a little quick photo teaser for ya! More coming soon (wedding, honeymoon, new house! ), so stay tuned. I was so thrilled to cut off 8 inches of my hair yesterday! I am just loving my short, swishy new do, and feel so sassy. What do you think? Do you see the sass? I'm telling you, this haircut has made me a whole new woman! Today is my very sweet hubby's 29th birthday. I woke up extra early to make him some tasty homemade birthday waffles and give him his presents. He looks like a happy camper, doesn't he? My goodness, I didn't know it was possible to love someone so much. I didn't realize I could be more in love with him today than on our wedding day, and I know it will be even more tomorrow than today. I am blessed by such a wonderful, selfless, funny, thoughtful, affectionate, caring, handsome (and I could go on for days) man. Looking forward to seeing all of our friends and fam for dinner and dessert at our house (!!) tonight. Don't worry, lots of pics will be coming! Hey there! 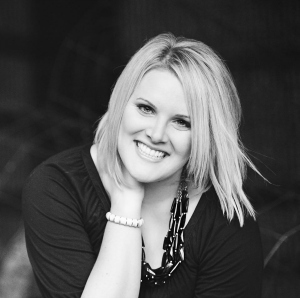 I'm Chelsea and I blog over at Lost in Travels. After my man and I got hitched two years ago, we started getting cold sweats every time we even thought about ‘settling down’ in our hometown. We wanted to do something out of the ordinary, something adventurous. We wanted to spend our lives traveling the globe. So what did we do? Sold all of our belongings that wouldn’t fit in two 50-pound bags and took the first flight to South Korea to teach English to snot nosed adorable little kids and never looked back! 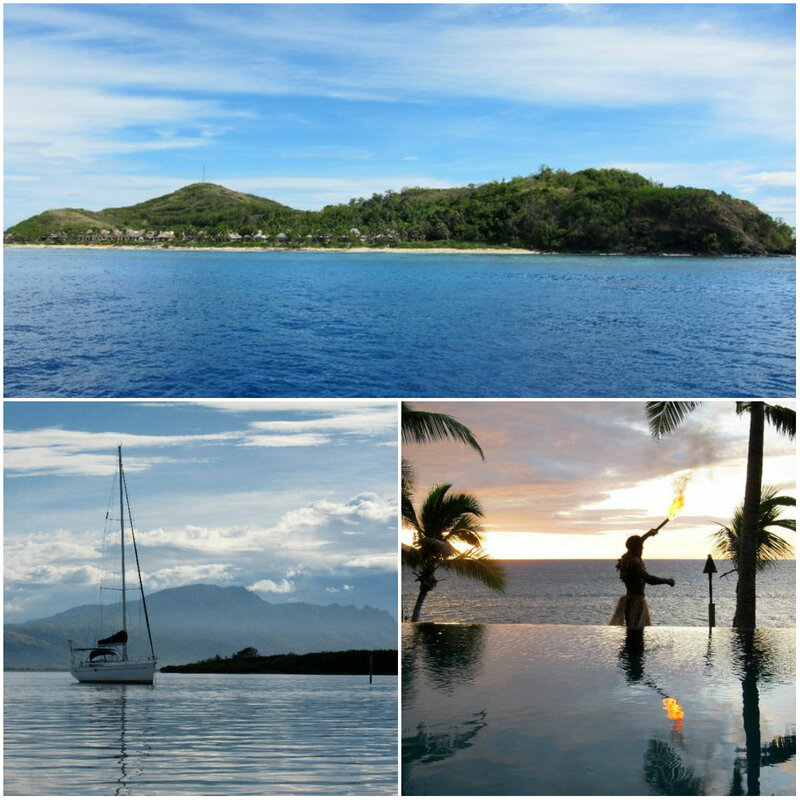 Tokoriki, Fiji- This is quite possibly the most perfect place to 'get away from it all'. There are several islands to choose from and many of them have only a few resorts or hotels on them. The views alone are worth the long plane ride it takes from the states. North Island, New Zealand- New Zealand is the perfect mix of landscape and adventure. 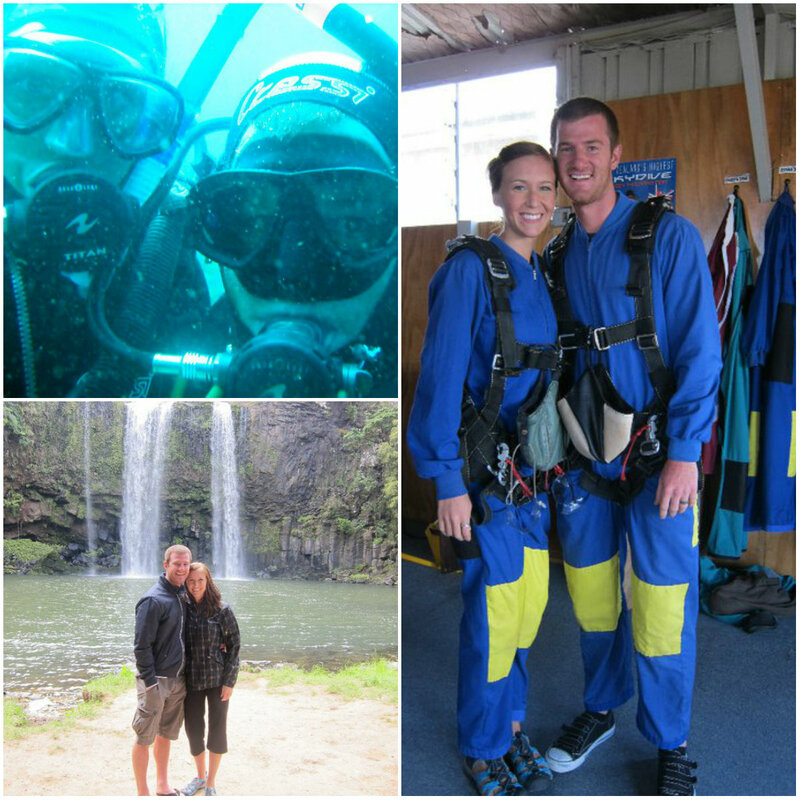 There are plenty of action sports to partake in including scuba diving and sky diving, both of which we couldn't resist. 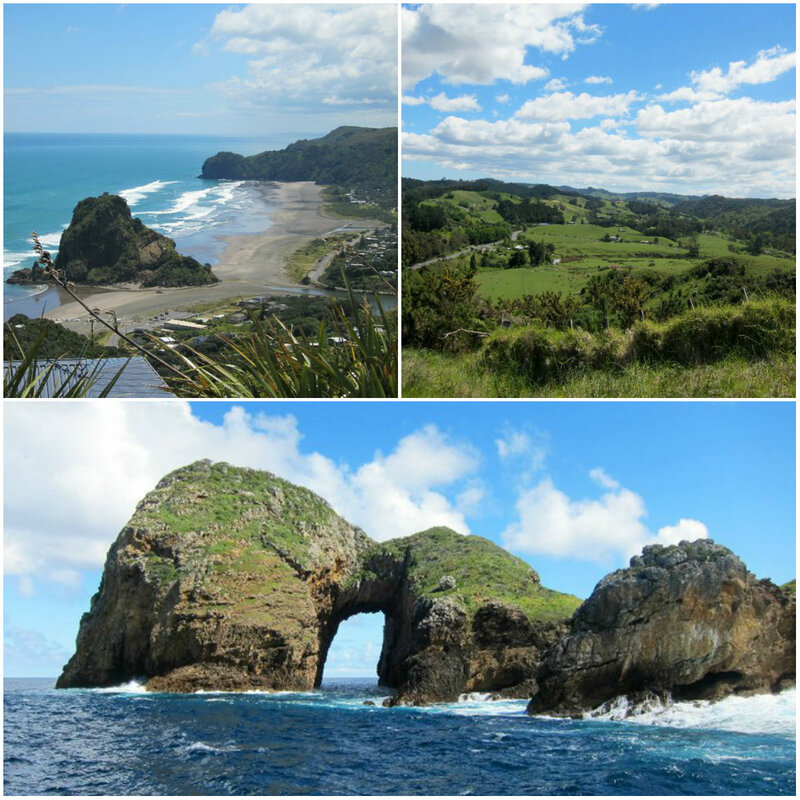 We also rented a car so we could really take advantage of the landscapes of the North island. We spent most of our time there driving through the country side and making pit stops along the way. No matter where you drive, you're bound to run into picture worthy scenery. 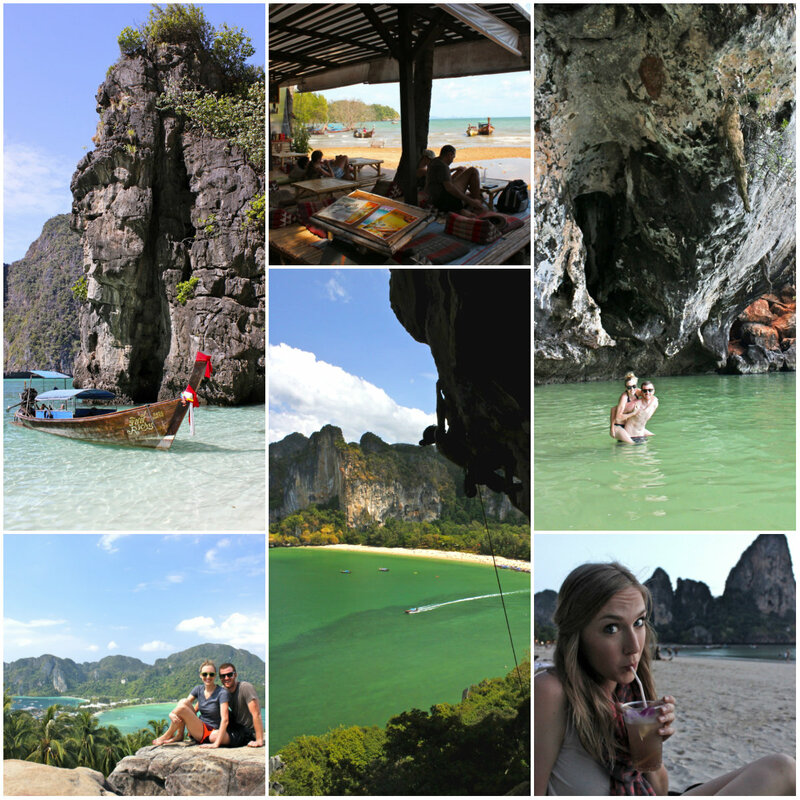 Phi Phi Island and Railay Beach, Thailand- this may just have been my favorite destination so far. The jetting rocks, the long-tail boats, rock climbing, hiking...you just can't go wrong in southern Thailand. 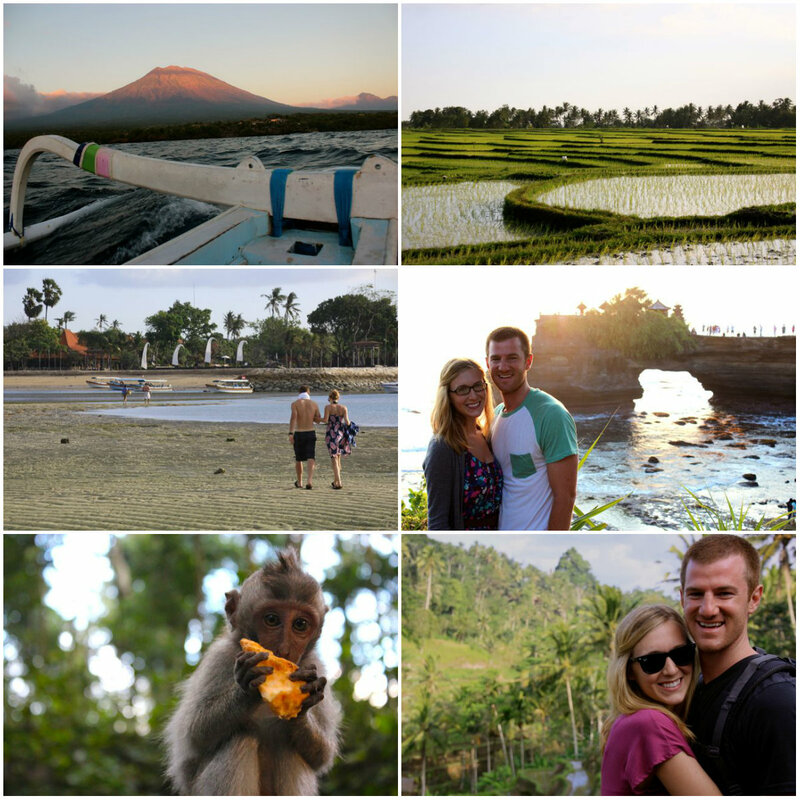 Bali, Indonesia- We definitely used up our whole week in Bali with sight seeing. From Mt Agung (we would love to go back and hike up!) to rice fields to Tanah Lot to the Monkey Sanctuary in Ubud, we could have easily spent another week enjoying all the beauty that Bali has to offer. Thanks so much for having me Meg! I'm sure I speak for everyone when I say that we can't wait till you get back so we can see some pictures! Be sure to stop by my blog where I talk about our daily lives as expats in the land of kimchi and our world travel adventures. 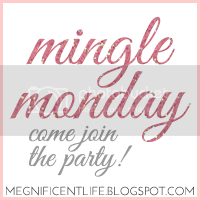 Be sure to say hi, I would love to hear from you! In a mere months, I will celebrate 5 years of marriage to my husband. Anyone who has been married for longer than a few hours knows that marriage is anything but easy. In fact, it's probably the hardest but most rewarding thing. Kind of like blogging (which I've been doing for 3 years). From the outside, it seems easy, but spend any amount of time at a computer and you realize just how tough it can be to share your life. I never planned on getting married. I planned out my wedding - several of them in fact. I wanted to make sure I knew what my wedding would be like for every single season. But I never really thought I would get married. Unless Justin Timberlake proposed. I would say yes to him. God had other plans for me. 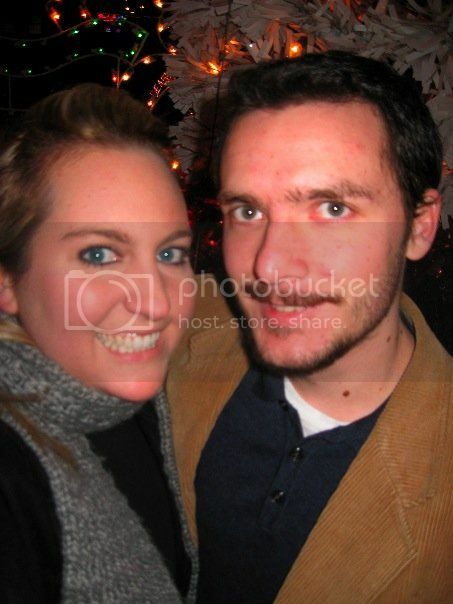 And during my second senior year of college, I was set up on a blind date with my husband. We both did everything we could to cancel the date. And then we both hurried through the night at Barnes and Noble and dessert at On the Border. When I woke up the next morning, I knew. Life happens like that sometimes. And sometimes it doesn't. I'm learning to embrace the times when things don't progress quickly (ahem, blogging. I'm leaning into the process and trusting in timing. I'm forcing myself to be still and to be patient. It's all been quite the journey as I tend to be a tornado of to-do lists, people to serve, money to make and plans. My husband.. the same one I didn't even really want to meet.. is the calm to my storm. He's often the voice of reason, the one talking me down off a ledge, the one reminding me of the good. But every now and then, we switch roles. Our roles compliment one another. If I am the voice of reason, it is because he is the tornado. And when he is flustered or worried, I tend to be the one talking him off a ledge and reminding him of the good. Even though I never planned on getting married, I had expectations of what marriage would be like. (Spoiler: marriage isn't what I expected.) It's the same for blogging. When I started blogging in 2010, after years of inhabiting different corners of the Internet, I did so with every intention of writing beautiful prose. I had never planned on being a "blogger", but I still had expectations of what it would be like. I was going to be different and not follow the rules of what makes a successful blog. Instead, I would stand out and people would flock to me for it. That didn't happen. In fact, people still aren't flocking to me. But I'm glad it didn't happen. I'm thankful that my first few years of blogging flopped. Because it's only been recently that I've figured out who I am as a person and as a blogger. Around the time I started feeling more comfortable with my blog, I also started feeling more comfortable in my marriage. We hit a groove. We're still hitting a groove. And while it's not easy, we're still in it together - fighting for one another daily and asking for forgiveness daily. Also? I let go of the expectations and began to just enjoy myself, my life and my marriage. I also stopped wanting to be the "next someone" and instead began to embrace being me. For me, the comfort just sort of happened. Both with my marriage and in my blog. I did a lot of work to lead up to the level of comfort I have now (like the letting go), but it still just had to happen. If you are starting out a new journey, let it happen. Do the work and trust in the process. Stick it out when it feels awkward or when you have nothing to say. Do whatever you have to do not to run away. Because it will happen. And when it does happen? When you let go of your expectations. Reality, while different, is so much better than what you think it (whatever your it is) will be. And almost everything leading up to that point (the arguments, the frustrations, the late nights) will be worth it. I don't have any real expectations now. Just hopes and dreams. And a few questions. But no expectations. Now, instead of planning for everything, I just want to live. I want to find joy in the everyday and share it. I want to embrace all the curveballs life throws and figure out how to weather the twists and turns. I want to be able to look back and think I never could have expected this. I know you thought you might see me today, but alas I am recovering from the world's best honeymoon vacay (or at least I hope so, since I'm writing this ahead of time - haha). * New button/link on lower sidebar! Go snag it, lovelies! Hi, I'm Alesha at Lifeology blog! When Meg said she was leaving on her honeymoon I instantly became jealous! It is such a magical time and an absolute blast to be married to your best friend enjoying each other no matter where you go. Have you ever had a place that gives you butterflies? We came home with so many fun and "had to be there" stories! Most of them revolved around my husband's complete inability to speak Spanish, didn't stop him from trying unfortunately. Even though most every person working at the resort spoke English, there were still a few instances when our knowledge of Espanol were tested. Andrew and I don't drink alcohol so every time we ordered a drink we explained we wanted it virgin. Either the bartender didn't understand us or they thought we were kidding a few times. Usually they got it right so by the last day I didn't even think to take a sip of my mojito to be sure it was virgin. One huge sip later I was certain I drank cleaner! All Andrew could do was laugh and laugh. I had my chance to get the last laugh when he was asked by our male chauffeur, "Buenos dias, senor! Como esta?" (Good morning, sir!) and Andrew responded, "Mucho grande, senora!" (Very big, Miss!) I took 3 years of Spanish in high school so I understand a bit and the chauffeur and I cracked up and made fun of him. Saddest part was my poor husband didn't realize his mistake and was confused as to what was so funny. I'm certain our driver then told his co-workers about the crazy American man who tried and majorly failed to speak Spanish! Next lesson learned? Stay on the VIP section of the beach. Unless you want to be heckled, harassed and spend WAY too much money on junk that you will forever regret owning. We wandered to the far side of the beach one day to possibly get my hair braided by some Dominican women when we were pulled into a man's shop where he sold keychains and artwork. The paintings were actually beautiful but we didn't have the money on us nor did we want to pack a rolled canvas to take back home. The guy would not let us leave! Two of his workers sort of surrounded us when we explained thanks but no thanks and he just would not let us go until we bought something. I was starting to get real scared so I grabbed Andrew's arm and he finally pushed through and we hurried back to the resort where they couldn't follow. Bartering off the resort is not a place for me! We went off the resort to snorkel around a coral reef and swim with sharks. Yep. You read that right, we choose to swim with sharks. We held sea urchins and a giant sting ray, swam with tiny colorful fish surrounding us and then into the shark den. I could snorkel all day long, even if it was with sharks! I loved the Dominican Republic it truly was everything I imagined of a tropical wonderland. Even more so I loved going with my best friend and spending every single minute with him relaxing and doing whatever we pleased with no worries, no stress, and no interruptions. It was such a nice break away from the day to day grind and just be us.